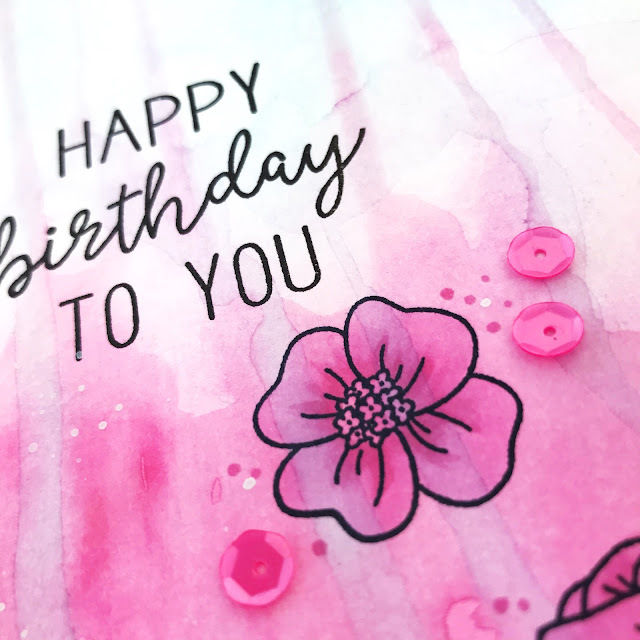 Layer Copic Markers over a Distress Ink watercolored background for a fun glazed effect! 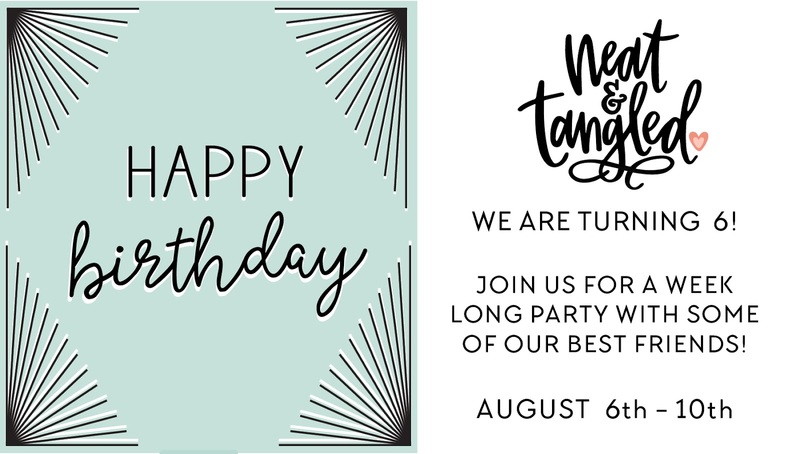 Happy 6th birthday to Neat & Tangled! I'm so thrilled to be joining in the celebration!!! We are having a little hop today so you should be arriving from the uber-talented Cathy Zielske's blog. And make sure to leave comments as you hop for a chance to win prizes!!! N&T is giving away one $100 and two $50 gift certificates to their shop!!! I had so much fun creating with the new Neat & Tangled Floral Frame set and mixing Distress Ink watercoloring with Copic Marker coloring! Make sure you head to Cheiron Brandon's blog next, she's awesome! What a beautiful card. I love blog hops because they inspire me to create--thank you. Love the cards. So beautiful. Oh wow!! I absolutely love these cards, those backgrounds are so lovely! Thanks for the inspiration, I must try this technique too. Lovely cards! So soft and pretty! Beautiful cards! I can't wait to try this technique. Thanks for your quick video! 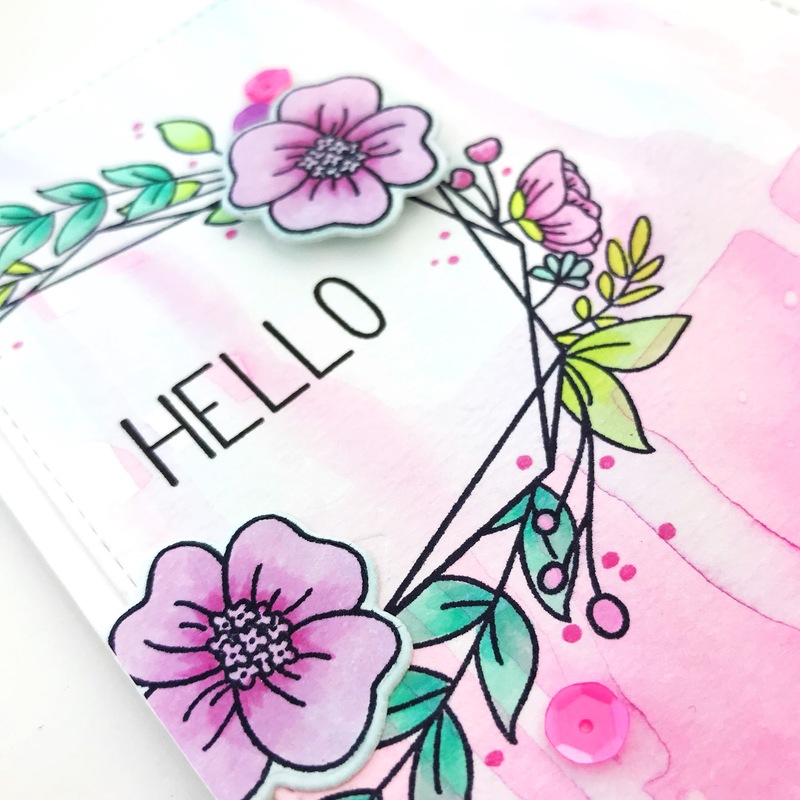 Love the awesome drippy watercolor chaos going on - it's just beautiful! Awesome cards, Carly. Beautiful. I love the colors. Thanks for the video! wow that is what I call thinking out of the box! You inspired me for sure. Love it! Wow!!! Wonderful cards and colouring!!! Beautiful cards! I especially like the birthday and awesome cards with some of the flowers colored and some not, very cool. Sweet colour palette on these cards. Thanks for sharing the technique video. Your card is just beautiful! I can't wait to try this technique. Thanks! What a fun technique, thanks for sharing a video with us! Interesting background technique. Thanks for the video. Have been trying to leave a comment all evening and looks like it might finally work, yay!! I just love your pretty background technique with the Distress Inks. The pastel pink and blue color combo is beautiful and charming! I love the pretty watercolor look of the backgrounds. Gorgeous! What a clever technique--mixing water coloring with Copics. The results are beautiful. Thanks. Oh my goodness ! Your trio of cards is absolutely gorgeous !! Gorgeous cards! I love the soft organic look of your watercoloring. Fantastic technique to glaze over with copics. Well, I don't know if its too late to post a comment or not. I've been trying to leave one since yesterday. 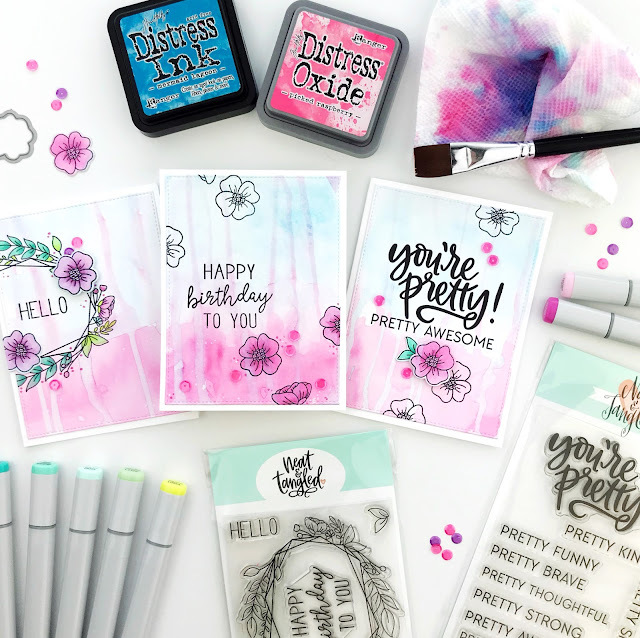 Great cards--very unique look with the eay you did your watercolor. My OCD would kick in if I tried to do messy watercolor! LOL! TFS!!! Such gorgeous cards! Love the colours you've used! Your collection of cards is so stunning! I love the blend of colors. Beautiful new products from Neat & Tangled. Beautiful cards - love your colors. 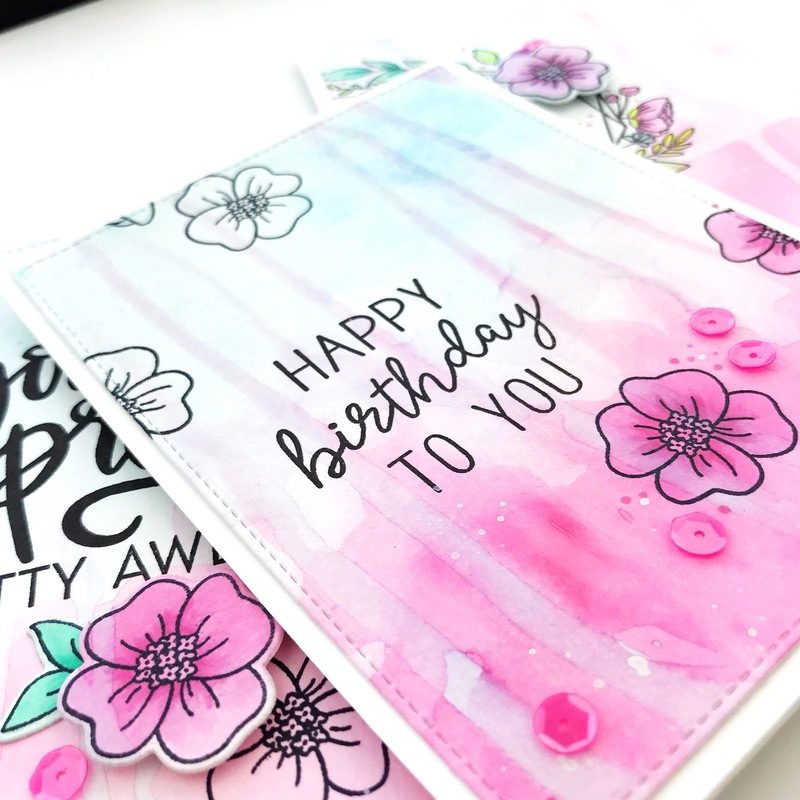 Love the unique water colored background on the gorgeous cards, and the pastel pink and blue. I love the dripping technique. It is sort of modern art looking.